Assam PWD Civil Engineer Jobs Recruitment 2017: Assam Public Works Department invites applications from the Assam state local candidates for the available Graduate Civil Engineer Jobs. There are total 200 Civil Engineer vacancies in this Assam PWD Recruitment Notification 2017. Candidates who qualified B.E or B.Tech in Civil Engineering they can apply for this Assam PWD Civil Engineer Jobs. 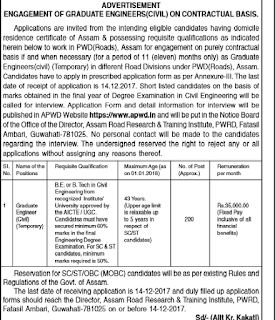 Application in a prescribed format only accepted for this Assam PWD Civil Engineer Recruitment 2017. Interested candidates may submit their application form to The Director Assam Road Research & Training institute, PWRD, Fatasil Ambari, Guwahati-781025. Selection for this APWD Graduate Civil Engineer jobs will be held through Merit in Final Year Examination of Civil Engineering Degree and personal interview. Application form and interview details are available in official website of Assam PWD @ www.apwd.in. More information regarding this Assam PWD Civil Engineer Jobs are given below. There are total 200 Civil Engineer jobs in this Assam PWD recruitment. These vacancies are purely 11 months contract basis only. Upper age limit is 43 years for this Civil Engineer jobs. For SC/ST candidates 5 years of age relaxation will be given. Candidates must have qualified B.E or B.Tech or it's equivalent Civil Engineering from any recognized university. Candidates selection will be based on Civil Engineering Degree Final Years mark and personal interview. 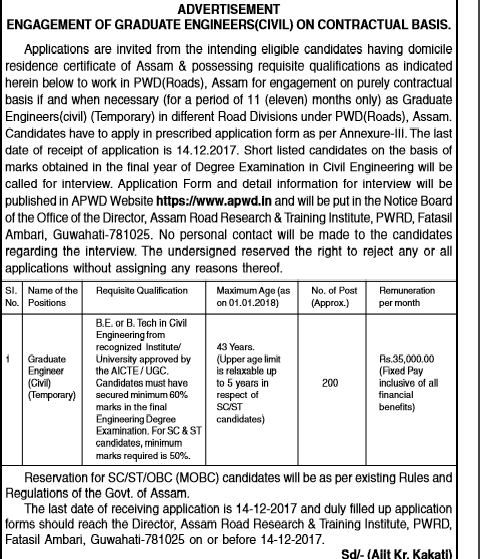 Eligible candidates may apply on or before 14-12-2017 in a prescribed format for this Assam PWD Civil Graduate Engineer vacancy. Address is given in the first paragraph. Application form is available for download at www.apwd.in.